We are working to update this page. In the meantime, you’re more likely to find the right satellite internet in the Best Satellite Internet Providers. It’s got info on pricing, speed, and data limits for every major satellite internet provider. We’ve reviewed and ranked the best Satellite TV and Satellite Internet companies, so if you’re in the market for satellite TV and internet service, you came to the right place. Satellite companies offer two types of service, with the most popular being TV service. To help you decide if satellite TV is right for you, we’ve reviewed the two largest satellite TV providers, DISH and DIRECTV. Both satellite TV providers beat out traditional cable companies like Xfinity, Spectrum, Cox, and others—you can see the Top 10 here. Why get satellite TV service? As of January 2017, both DISH and DIRECTV offer guaranteed pricing for the life of their contracts (two years), and they’ve done away with additional fees. Other TV providers still list pricing that doesn’t include additional fees, so you’ll end up paying more than what’s advertised. A two-year contract for satellite TV can be a disadvantage, but other TV providers require contracts as well (one or two years), and those TV providers that don’t require a contract are typically more expensive than satellite TV (compare Comcast pricing to DISH pricing). Because satellite TV is available nationwide, you can get TV in the most remote of places, including your cabin in the woods. If you want mobile TV, both DISH and DIRECTV have service for RVs and boats, so you can get satellite TV on the road or on the lake. If you’re wondering what makes satellite TV unique, check out our rankings for the Best Satellite TV. 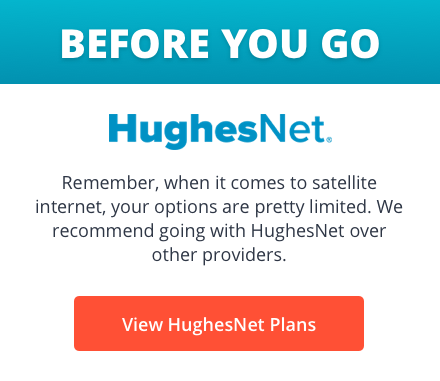 To help you decide if satellite internet is right for you, we’ve reviewed the two largest satellite internet providers: Viasat and HughesNet. We’ve reviewed Viasat and HughesNet and ranked them based on pricing, plans, data, speed, and support. If you’re not sure where to start with satellite internet or what makes it unique, check our rankings for the Best Satellite Internet. Why get satellite internet service? If you’re interested in satellite internet, it might be because there’s no other option for internet service in your area; however, satellite internet has made strides to compete with the likes of cable internet and DSL. For example, if you’re looking for plans with download speeds of 5 to 25 Mbps, you’ll notice satellite internet pricing is comparable to some cable internet providers. The biggest advantage to satellite internet is nationwide availability. If you live outside the suburbs or in a rural area, satellite internet is the best way (maybe the only way) to get internet service. Satellite internet isn’t as generous as cable internet when it comes to data allowance, but outside of multiplayer online gaming, satellite internet can cover most internet needs. Most satellite companies offer bundled internet + TV options which can save money on monthly bills, so make sure to ask your representative if bundled options are available in your area. For more info, review the Best Satellite Internet Providers.